If there’s one color you will need to have in your wardrobe this fall winter season, it’s most definitely brown. Brown has certainly made a comeback for this 2018-2019 season and it can be seen in both clothing and footwear, and for both men and women. So if there’s one color that you should be wearing this season it’s brown. And as for shades of brown, it really doesn’t matter. Beige, camel, chestnut, dark brown – they are all on trend. That’s part of the beauty of it. No matter what shade of brown you’re wearing, you can’t really go wrong. On the fall winter 2018 runways Salvatore Ferragamo highlighted the brown color trend. Combining shades of brown and using luxury fabrics such as leathers, silks, wool and shearling to create a stylish collection for the modern man. 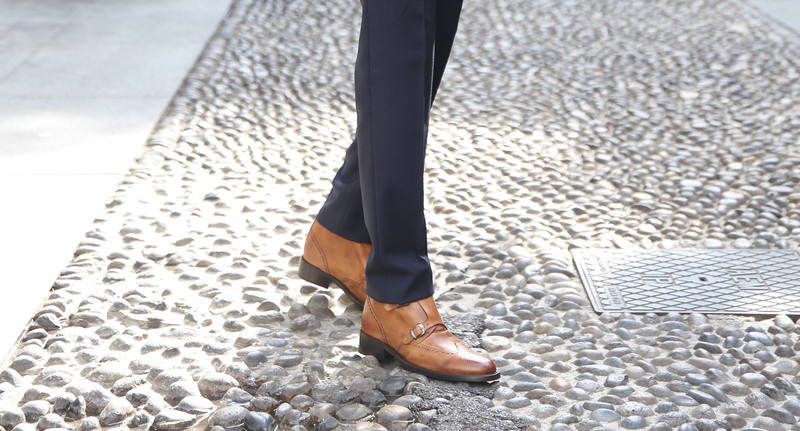 A dark brown suit can be amplified by brown leather shoe, such as the Providence model by GuidoMaggi. This luxury dress style features a soft calf leather, hand buffered upper and buckle detailing. The handcrafted Providence elevator shoes can be paired with a range of other shades of brown and can add an extra 3.1 inches discreetly to your height. They will look equally chic with a brown leather jacket. Alexandre Mattiussi is also embracing the brown trend for the fall winter collection. Keeping the looks casual chic with camel shades, brown tartans and checks, these styles can be paired with sneakers for a weekend look. The New Hampshire elevator sneaker can be ideal for wearing with the range of brown colored outfit options. Mix and match your brown shades or pair with some sleek brown sneakers such as the Hartford, for a trendy look that can keep you comfortable and increase your height. Even for an iconic Italian fashion house like Prada, brown is making a comeback. Combinations of browns, whites, grays and blacks can be seen on the fall 2018 runways, creating more options for wearing the color brown this season. To stay on trend with influence from Prada, try pairing your brown suit with a sleek pair of gray shoes, like the Persian Gulf model from GuidoMaggi. These luxury height increasing shoes are made from fine crocodile leather and feature a brown leather sole that will enhance your brown suit. Boosting your height by 2.6 inches they will also increase your confidence.